For the 2018 international women's day, we profile 18 inspiring women who lead the field in AI, Analytics, Big Data , Data science, and Machine Learning areas. Women are underrepresented in STEM fields - science, technology, engineering, and math. For instance, women made up 27% of people employed in computer and mathematical occupations in 1960. But instead of growing over several decades, as many more women participated in the workforce overall, that number had declined to 26% by 2013, according to a 2015 analysis of US Census data. 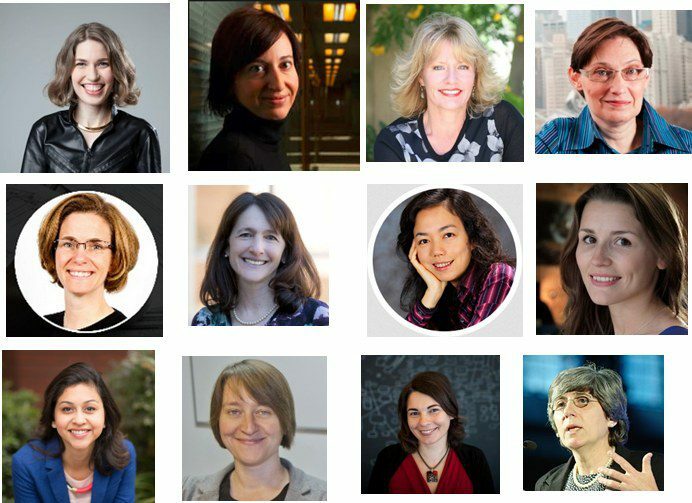 However, we hope that the number of women in STEM will increase and in honor of International Women's Day, here are profiles of 18 inspiring women in AI, Analytics, Big Data, Data Science, Machine Learning, and Robotics. Carrie Grimes Bostock, Distinguished Engineer at Google. Grimes has spent her career at Google, where she currently works on data-driven resource planning, cost analysis, and distributed cluster management software as part of the Technical Institute Group. Grimes holds a PhD in Statistics from Stanford University and an AB in Anthropology from Harvard University. Meta S. Brown, @metabrown312, is a consultant, speaker and writer who promotes the use of business analytics. A hands-on analyst who has tackled projects with up to $900 million at stake, she is a recognized expert in cutting-edge business analytics. Jennifer Chayes @jenniferchayes, is a Distinguished Scientist and Managing Director at Microsoft Research. Chayes said during the career panel discussion at the Women in Big Data event: "You shouldn't let your fear about your own abilities or a fear that you might be an impostor or something have any bearing on the kinds of decisions that you make. You should just take that part of your brain and say thank you for sharing and just put it aside. We all have that part of our brain and if I'd listened to that part of my brain I would have had a very boring life." Chayes holds a PhD in Mathematical Physics from Princeton University. Silvia Chiappa @csilviavr, is a Senior Research Scientist at DeepMind, working at the intersection of probabilistic modeling and deep learning. Prior to DeepMind, she worked at Microsoft Research Cambridge, at the Statistical Laboratory University of Cambridge and the Max-Planck Institute for Biological Cybernetics. Jill Dyche, @jilldyche, VP SAS Best Practices at SAS Institute. She's the author of several books, including the most recent one, The New IT: How Technology Leaders Are Enabling Business Strategy in the Digital Age. Dyche is currently working on a side project, an e-book that advocates for simple improvements to animal shelter practices to improve pet adoption rates. Jana Eggers, @jeggers, CEO of Nara Logics, a neuroscience-inspired AI company, providing a platform for recommendations and decision support. Her career has taken her from 3-person business beginnings to 50,000-person enterprises. She opened the European logistics software offices as part of American Airlines, dove into the internet in 1996 at Lycos, founded Intuit’s corporate Innovation Lab, helped define mass customization at Spreadshirt, and researched conducting polymers at Los Alamos National Laboratory. Carla Gentry, @data_nerd, is one of the top data science influencers on social media. She is currently a Digital Marketing Manager at Samtec. She worked with many Fortune 500 companies. She is able to take huge complicated databases, decipher business needs and come back with intelligence that quantifies spending, profit and trends. Being called a data nerd is a badge of courage for this curious Mathematician/Economist because knowledge is power and companies are now acknowledging its importance. Nikita Johnson, @nikitaljohnson, is the Founder of RE•WORK, an events organising company that brings together a cross-disciplinary mix of industry, startups and academia to explore the latest advancements in emerging technology, specifically artificial intelligence, and their impact on solving challenges in society. Fei-Fei Li, @drfeifei, is an Associate Professor at the CS Dept. at Stanford and the Director of the Stanford Artificial Intelligence Lab and the Stanford Vision Lab, where she works with the most brilliant students and colleagues worldwide to build smart algorithms that enable computers and robots to see and think, as well as to conduct cognitive and neuroimaging experiments to discover how brains see and think. She received Ph.D. from Caltech. Hilary Mason, @hmason, is a VP of Research at Cloudera. She is also the Founder of Fast Forward Labs, a machine intelligence research company, and was the Data Scientist in Residence at Accel and the Chief Scientist at bitly. She loves data and cheeseburgers. Karen Matthys, Executive Director, Institute for Computational and Mathematical Engineering (ICME). She is working on the 30by30 campaign, which has a goal of increasing to 30% the women in computer science and engineering roles at all levels of organizations by the year 2030. Neha Narkhede, @nehanarkhede, is a co-founder and CTO at Confluent, a company driving a popular big data tool that enables real-time streaming capabilities - Apache Kafka, technology developed when the co-founders were all working at LinkedIn. Amy O'Connor, @ImAmyO, Big Data Evangelist at Cloudera. She joined Hadoop distributor Cloudera in 2013, coming to the company from Nokia, where she served as senior director of big data. In her role at Cloudera, she advises customers as they introduce and adopt big data solutions. She holds a BS in Electrical Engineering from the University of Connecticut and an MBA from Northeastern University. Megan Price, Executive Director at Human Rights Data Analysis Group @hrdag. Her organization leverages statistical analysis to surface evidence for use in testimony to push for action and change. The group has worked on a number of projects in locations that include Guatemala, Columbia, and Syria. For the Syria projects, Price served as lead statistician and author of two recent reports commissioned by the Office of the UN High Commissioner of Human Rights on documented deaths in that country. She is a research fellow at the Carnegie Mellon University Center for Human Rights Science, and earned her PhD in biostatistics. Monica Rogati, @mrogati, Equity Partner, Data Collective at Advisor, Insight Data Science. Monica is the former VP of Data at wearables company Jawbone and a former data scientist from LinkedIn. Today she is focused on providing technical due diligence and advice to the Data Collective venture capital group and serving as an advisor for the Insight Data Science Fellows Program, a post-doctoral training fellowship for bridging the gap between academia and data science careers. Caitlin Smallwood, VP, Science and Algorithms at Netflix. She leads an advanced group of mathematicians, data scientists and statisticians at this digital entertainment company. Her group focuses on predictive modeling, algorithm research and prototyping, and other deep analytics across the company. Her career has included work at Yahoo as the director of data solutions and at PricewaterhouseCoopers as a senior manager in quantitative consulting. Kelly Thompson, SVP, Global Category Development and Merchandise Solutions at Wal-Mart eCommerce. Thompson directs strategy, structure, and the operating model for Wal-Mart to combine merchandising with data and analytics. Wal-Mart is one of the biggest companies in the world, and people think of big companies as being slow, but Thompson said her organization is actually building something more agile inside this big company. Manuela Maria Veloso is the Herbert A. Simon University Professor in the School of Computer Science at Carnegie Mellon University. She was the President of AAAI until 2014, and the co-founder and a Past President of the RoboCup Federation. She is a fellow of AAAI, IEEE, AAAS, and ACM. She is an international expert in artificial intelligence and robotics. Part of this post was published in KDnuggets previously.